Who are we? We (mostly parents) take turns to care for our children during the Sunday morning meeting, so that other parents can attend the meeting, receive spiritual nourishment, and participate in the building up of the church. 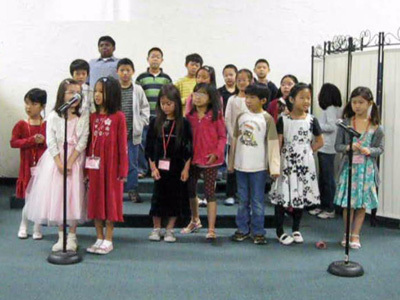 Beginning with preschool and continuing through 6th grade, we enjoy singing, memory verses, and age-appropriate lessons regarding proper character and the Bible. For the children in preschool through kindergarten, we teach about God’s creation to instill an appreciation and love for God our Creator. During first grade, we discuss proper human relationships, both within the family and with others. These lessons explain how they can relate to others in a way that pleases God and harmonizes with His Word. “But before faith came we were guarded under law … So then the law has become our child-conductor unto Christ …” (Gal 3: 23-24). All children should know the Ten Commandments (the law) to help train their conscience towards self-control. This is the basis of proper character. This is important because character determines how useful people are to themselves, their families, to society, and even to God. In fifth grade we review how Jesus meets all man’s needs. Jesus loves and reaches out to all of mankind. Examples are Nicodemus (high class), the Samaritan woman (a sinner), the sick, the strong, the rich, the poor. Everyone needs Jesus. Finally, in 6th grade, we review the truth and experience of God’s salvation. This is the time that we, along with the parents, share the gospel directly and look for a genuine salvation experience within each child. Our prayer is that each child is genuinely saved and baptized before they graduate from 6th grade, and that the truth imparted would preserve them through junior & senior high school and college. “Thy word have I hid in mine heart, that I might not sin against Thee” (Psalm 119:11). We care for the children during the Sunday morning meeting, so that the parents can attend the meeting. For the babies and toddlers, we provide babysitting service in a loving environment so the parents can enjoy the adult meetings.